Lock in a great price for Santiburi Koh Samui – rated 9.1 by recent guests! It had a large beach front steps away from the villas and restaurant. Fabulous spa too. Excellent services and gracious staff. Wish I had more time to enjoy the many activities on the property. Serene, tropical paradise. Superb service - the staff are amazing. Sports centre is brilliant. Beach is good (quite steep and therefore hard to walk on); brilliant spa and the best massage on the beach ever! Rooms were superb. the perfect location to relax and enjoy the service. Breakfast was top notch. Beach area and pool fantastic. Santiburi Koh Samui This rating is a reflection of how the property compares to the industry standard when it comes to price, facilities and services available. It's based on a self-evaluation by the property. Use this rating to help choose your stay! One of our top picks in Mae Nam.Santiburi Koh Samui is located along beautiful Mae Nam Beach in Koh Samui. Featuring luxurious villas and suites, it offers a tropical outdoor pool and free Wi-Fi. Surrounded by greenery, the spacious accommodations at Resort Santiburi Beach feature polished wooden floors and traditional Thai furnishings. In-room entertainment is provided with the flat-screen cable/satellite TV and DVD player. Guests can relax in the hot tub or indulge in a pampering massage at the spa. 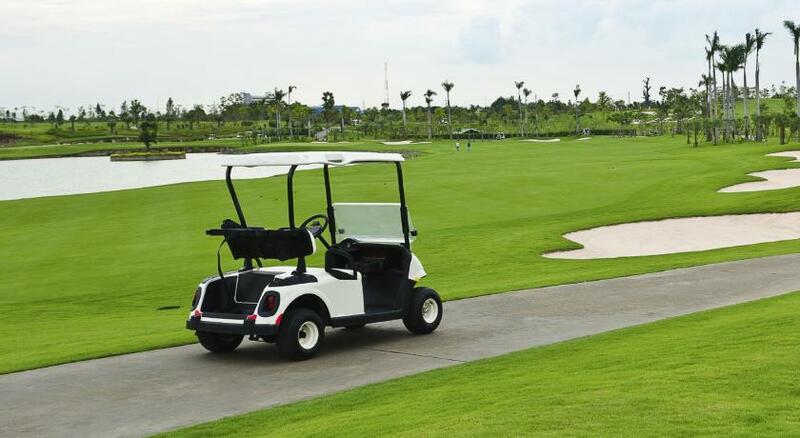 An 18-hole championship golf course is just a 5-minute drive from Santiburi. For a good workout, water sports facilities are also available. Authentic Thai dishes and Mediterranean food can be enjoyed under the stars at The Beach House. Refreshing evening drinks are served at the cozy Lounge. Santiburi Koh Samui is about 5 mi from Samui Airport. When would you like to stay at Santiburi Koh Samui? This duplex suite is located at the center of the resort, with quick access to the swimming pool and views of the central courtyard and gardens. It features a living room and a private balcony. Bathroom comes with a shower facilities. Spacious free standing modern Thai villa with private terrace and luxurious bathroom. This villa features a plunge pool and a terrace. The bathroom has two vanity sinks, a round bathtub and a separate shower. Located on the beach front, this one-bedroom Thai villa has a terrace and a living space. The bathroom features two white vanity sinks, a round bathtub and a separate shower. This free-standing, contemporary one-bedroom Thai villa features a terrace. The bathroom has two white vanity sinks, a round bathtub and a separate shower. Offering a private pool with sun loungers, this villa features a separate living room with a sofa and a flat-screen TV as well as a bathroom including a bathtub. This family room features a balcony, satellite TV and seating area. This villa features a balcony, mini-bar and patio. House Rules Santiburi Koh Samui takes special requests – add in the next step! Santiburi Koh Samui accepts these cards and reserves the right to temporarily hold an amount prior to arrival. Could do with a little more food choices - only 2 x eating outlets which are fine but one more would help. Also, the food is a little too elaborate and could do with being toned down a little (for example - every single main course we had over a 5 day period had huge slices of fruit and flowers as decorations that took up half the plate - a little boring after a while!). Small fault though - which should definitely not put anyone off. Food was fresh and flavoursome. Even though the menus did have photos on them (a pet hate!) A little more atmhosphere would be good - it was incredibly quiet and staid (mainly middle aged Europeans staying without children). But as a family of 4 we felt a little conscious that we were having ‘fun’. The main pool is massive but has very little on offer for children - and it is not really a lap pool either. And it is as hot as a bath - a little strange. A small quibble only. And finally, lots of mossies! Everything! Best hotel I ve been in. Absolut Highlight was the free ice cream at the beach. Staff at the beach house restaurant could be more attentive. Was left eith one menu for four people and was waiting for a long time. The teo bedroom duplex did not meet our cleanliness standard. Great rooms and amazing staff. Details is what makes a stay perfect. Sadly there was construction on the kids playground during our stay and there was a lot of noise at the pool area. I went to the staff to complain about this but all I got was: They will be finished at 16:00... to continue the next day. Not what you expect when you pay a lot of money for this hotel. Keep in mind that if you are staying in one of the duplex rooms that these are connected to the room next door by a connecting door which might be noisy depending on your neighbours. Also below all the duplex rooms on both sides of the hotel are kids playgrounds (very out of place and hotel theme by the way). Under our room was a table tennis set up which again was noisy at some times. The location of the hotel is alright but not perfect. I'd rather stay closer to the Bophut area. If you go out of the hotel there are some restaurants but the area is dirty and the road is dangerous. We had some food at the hotel which wasn't great (or better then any cheap thai food stall). On a positive note, the pool and beach area are really nice. The hotel has lots of gardens and green foliage. Service at the beach was excellent with towels being set up for you. When it's really hot you will be refreshed by a cold towel. Also, there is a daily icecream stall that comes by around 14:00, it supplies free ice cream cones to all. It was quite peculiar though that on the first day we got a freshly made cone with good quality ice but on the remaining days of our stay we got a cheap cone with a lot lesser quality ice cream. Sorry, but it's all about the details. There’s a service charge of 10% automatically on the bill which we are very happy to pay but it’s a bit cheeky leaving another line at the bottom for “service” too. We were given an option to upgrade to beach villa for a small extra amount. It was superb.